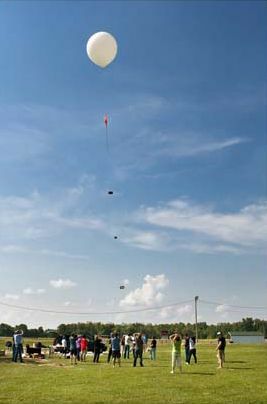 A NASA balloon carries student-designed experiments during the first Balloonsat High-Altitude Flight competition in 2010. Next week, four experiments designed by high school students will take to the skies aboard a weather balloon in a NASA competition. The four science projects will launch on May 19 from Upper Sandusky, Ohio, as payloads in a NASA-built helium weather balloon. The balloon will soar to the stratosphere, about 20 miles (32 kilometers) above the Earth's surface, in NASA's second Balloonsat High-Altitude Flight contest. North Carolina School of Science and Mathematics, Durham, N.C. "Variations in Energy Output of Solar Cells at Varying Altitudes Compared to Weight and Cost." The winning team will be announced on July 1, and Glenn representatives will present an award to the winners at their school, NASA officials said. The Balloonsat contest and other, similar educational programs help NASA engage students in science, technology, engineering and mathematics (or STEM). These disciplines are critical to the agency's future programs and missions, officials said. The competition is sponsored by Glenn's Educational Programs Office and is funded by the Teaching From Space Office at NASA's Johnson Space Center in Houston.